A new professional grade DPC (damp proof course) in a tube! No specialist injection equipment required. Our DPC cream injection has been developed for ease of use and convenience. Dri-wall DPC injection cream is an extremely versatile, modern treatment for rising damp, without needing a pressure injection pump. You don't even need to drill the bricks or stonework. This DPC cream injection tackles your rising damp problem by migrating laterally through the mortar joints. That is because they are softer and much easier to drill than most brickwork and stonework. This DPC cream injection can successfully treat rising damp in cavity walls, double brick (9-inch) walls and single brick (4.5-inch) walls. Dri-Wall Injection Cream comes in 380ml (fits most skeleton guns for small jobs) or 1-litre cartridges for the professional applicator. The advanced, ready-to-use, chemical damp proofing formula migrates through the mortar beds. Once cured, it forms an effective moisture barrier (DPC) within the wall. The DPC Injection Cream is applied via holes drilled horizontally into the mortar joints at 120mm intervals. You can inject from either inside or outside the building. The objective is to stop the rising damp ideally by injecting at 150mm above the external ground level. Please note that the professional 1-litre cartridge can only be applied with the dedicated applicator gun and nozzle. The 380ml fits most good quality skeleton guns and comes with a plastic nozzle suitable for single 4.5" course only. For 9" to 18" walls and cavity walls you will need the companion 400ml nozzle to ensure correct delivery. How much Dri-Wall will I need to inject my damp walls? A damp proof course is one of the most effective methods of dealing with rising damp. 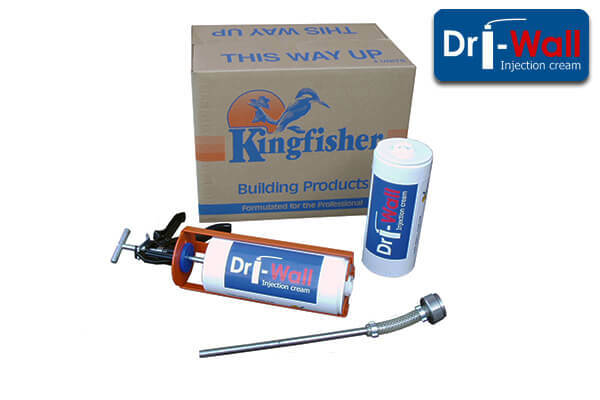 Treating rising damp couldn�t be easier using this high-quality DPC injection cream. It is available at a very competitive price, offering value for money that is unrivalled by most damp proofing treatments. We have a wealth of experience supplying damp proof courses, ensuring we supply only the finest damp proof cream. As a barrier against rising damp, this DPC Cream Injection is second to none. If you are unsure about any aspect of damp proofing walls and related issues, please get in touch. We have been a leading remedial DPC manufacturer for almost 30 years, so use our FREE advice to save you time and money. Followed the how to guide on the website - injecting the wall was pretty straight forward but wasn't sure about re-plastering so rang kingfisher. They spent quite a bit of time with me explaining it all so we got it right - v helpful tech support.